We have packed our final issue of the year with useful information to take into 2019. 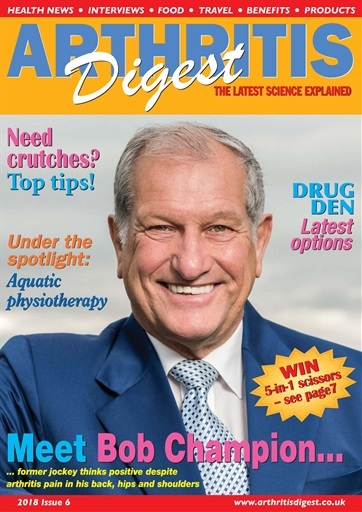 Whether you’re looking to eat well (page 5), carry on gardening (page 7) or try aquatic physiotherapy (page 8) it’s all going on. 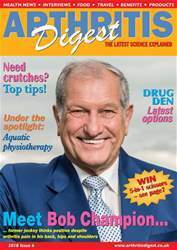 Self-management of long-term health conditions is covered on page 15 and if it’s crutches you’re after, you’ll know exactly what to opt for after reading the round-up on page 17. Bob Champion discusses the importance of staying positive despite ill health. After battling testicular cancer whilst at the peak of his career Bob now faces daily arthritis pain, but that doesn’t stop him travelling around the country on an almost daily basis. For those seeking something more restful while 2018 draws to a close, turn to the back of the issue for a review of hydrotherapy minibreaks.